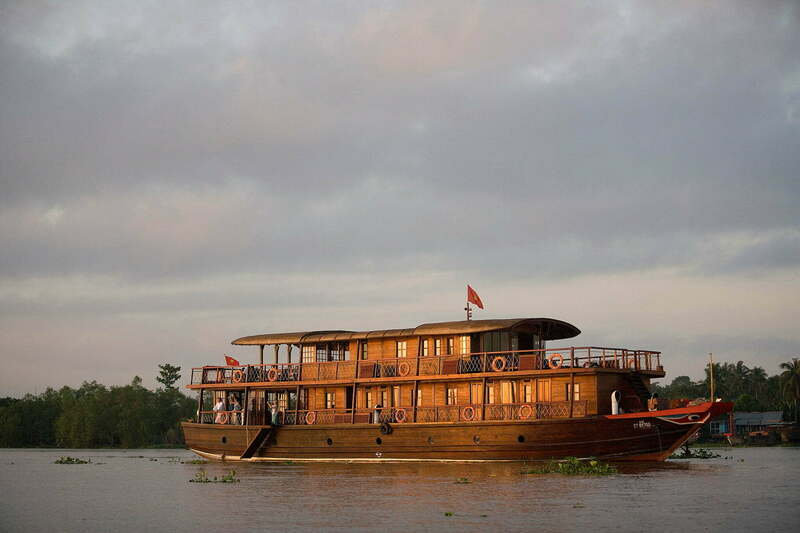 Description: Welcome to Bassac Cruise, a friendly and professional wooden boat in Mekong River. We bring to you the three elegant cruises that sharing the same quality in three impressing different sizes. It is known as one of the most long-standing boat in the rural Mekong, Bassac always receipts customers' believe from we have begun up to now. The cabins of Bassac I/II/III are perfectly decorated with full of modem things such as air-conditional, individual bathroom, accompanied by other convenient furnishes. Especially, Bassac Mekong Cruise have a standard restaurant which works all day, a very attracting gallery, a small office room and an amazing sundeck with 700 sqm. Furthermore, we, the three sister cruises of Bassac are pride of our original composition from Sao wood that are respected by the Mekong local shipbuilders. The Sao wood is only used in aristocrat level or royal products. The most outstanding points of Bassac Team is a flexible Itinerary. Our crews always prepare a list of interesting destinations with the aim of traveling with you to whatever you want in Mekong Delta. Arrival in Cai Rang floating market, transfer onto a local boat to visit the floating market, then a noodle factory and return to the Ninh Kieu pier by mid-morning.